Home Garage Door Thinking About Replacing Your Garage Door? Thinking about replacing your garage door? Here are some items to consider courtesy of the friendly staff at American Garage Door and Gate Systems in Wheat Ridge, Colorado. There are a few reasons why our customers choose to replace their garage doors. For some, it is because their current door is severely damaged and a new door is desperately needed, whereas for others the reason is more cosmetic or simply wanting to update an outdated door. 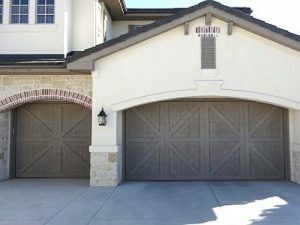 Whatever your reason for wanting to replace your residential garage door, these are some great things to consider. Choose your materials wisely. There are lots of options out there, and there isn’t a one size fits all approach. Of course, the best way to choose the right materials is to discuss this with one of our experts here at American Garage Door, but here are a few things to think about to get you headed in the right direction. You can find garage doors made from steel, wood, aluminum and fiberglass composites. Steel doors are relatively inexpensive, sturdy, hold up well against the weather and can look fantastic, making them a very popular choice. Custom wood garage doors lend a bit of traditional charm to any home and are usually chosen for purely cosmetic reasons as they require more maintenance and weather proofing in comparison to other materials. Fiberglass and aluminum are both nice because they are lightweight and inexpensive, but are more prone to getting broken or dented. Modern day garage doors come in such a variety of styles and colors that basically if you can dream it, you can have it. Have fun and get creative choosing just the right color and style combination to complement your home. This is an excellent way to up the curb appeal of your home, particularly if you are thinking of selling in the future. Budget is always a big consideration and garage door costs can vary considerably depending on the style and garage door brand – Amarr, Martin, Clopay and others. If you’re replacing the garage door opener, that’s another cost to consider. Even if you invest a bit more than you planned to, you can expect a return when you sell, as well as lower energy costs if your new door is insulated. A new garage door is one of the best things you can do for your home’s curb appeal, particularly if the old one is outdated or beat up. Even though you may not yet be enamored with the idea of spending the money on a new one, you don’t have to consider that money wasted. Curb appeal has a significant impact on a home’s selling price, and you could even potentially get back everything you put into the door, plus you get to enjoy it for the remainder of the time you live in the home. So, if you are thinking about replacing your garage door, be sure to give us a call today. One of our expert staff here at American Garage Door and Gate Systems will be happy to answer your questions and help you pick the perfect replacement.